Since putting in an interim top on 12/27 just below $101/barrel WTI futures have retraced losing almost $10/barrel. 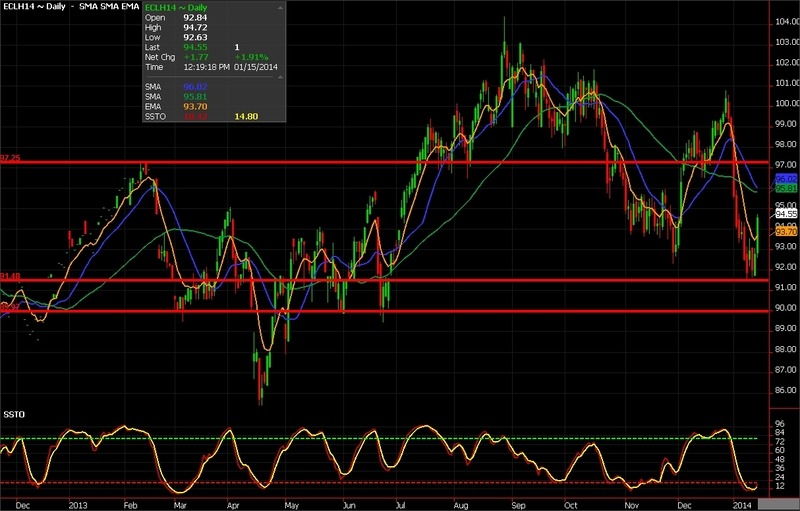 The first red horizontal line is seen on March futures near $91.50 and under that level support comes in at $90. It will take a settlement above the 8 day MA(orange line) for confirmation which I expect to see play out in the coming sessions. Weak demand is expected to be confirmed in this week’s inventory report but is that already factored into prices contributing to the recent sell off? Futures are off 6% ytd and have finished in the red 8 of the last 10 sessions. EIA data for the week ending January 3rd showed a significant bump in both gasoline and distillate supplies, 6.2M barrels and 5.8M barrels respectively…much larger than anticipated. We could see more builds than draws in the coming months so longer term bullish trade is not the play in my eyes but will attempt to play a bounce from current trade as we think we have overshot to the downside short term. Today’s DOE for the week ending January 10th showed refineries operating at 90% capacity, gasoline production decreased 8.3M barrels and distillate production decreased 4.7M barrels per day showing the lack of demand as expected. At 350.2M Barrels US Crude inventories are near their upper limit of the average range for this time of year. Not painting a bullish picture long term. Today’s bigger draw than anticipated leads to the current bounce short term …so how to play it? Position for this bump or sell into higher trade in the coming sessions…. Long (1) March futures and sell an out of the money call 1:1. The $95 March is currently 40 cents out of the money. You would collect approximately $1750 per and this option has a current delta of 47% so you should realize about 1/2 the underlying move. Buy March/Sell December WTI both in 2014 1:1. Playing this spread looking to capitalize on a move higher in the next week but I think futures stall near $97/98 in March futures. That being said the current spread is trading near $5.60 premium to March and I think we trade to $7.50 premium. Looking to make $2 or $2,000 on this spread. I would be willing to risk 50 cents for every potential $1 in profit you are targeting.